All of us Pink Puck-ers love hockey. But we all have different reasons for our love of hockey; and different ways of showing it. Some of us actually play, some of us have grown up in hockey communities, and some of us have grown to love it through the people around us. That’s me. I wish I could say I have been a life-long hockey fan but my secret is that I was forced to get into it by my boyfriend (one of the things I will be forever grateful for). Being a hockey girlfriend for almost four years now, I have learned some very valuable lessons. Be supportive. Even when you would much rather stay on your comfy couch with a blanket and good book (or NHL game), find the motivation to get up, sit in a cold rink, and cheer him on. We all like hockey here, right? So whether it’s high school, college, Juniors, or any other league, we can appreciate a good game and support our boyfriends at the same time. Do NOT let him in your car after a game unless he showers first. Sometimes it even takes two showers to get that smell off. Anyone who has been around a hockey player fresh off the ice knows the smell I am referring to. It’s very distinct. And unless you want your car to smell like that for weeks, I suggest making him turn around to go back and take a shower. Trust me; it’s worth waiting the extra 20 minutes. Prepare for impromptu “yard sales” on their (or your) lawn. And when I say yard sale, I mean a small tornado of hockey equipment lying out to dry. With no consideration for possible rain, animals, bugs, or house guests, there will be plenty of times he will mistake a driveway for a laundry room (but I guess we shouldn’t complain—at least the stink stays outside). Make sure your fridge is stocked with food if he comes back to your place after a game. Seriously, I mean stocked. It is important, though, to make sure everything is fresh and edible. Even two-month old leftovers seem to be fair game to them. Their “flow” never looks bad. Even if it does. For some reason (that I will never be able to figure out) hockey players are strangely proud when their hair sticks out of their helmets. Some guys can pull this off—take Kris Letang for example. But then on the other hand, there’s this guy. 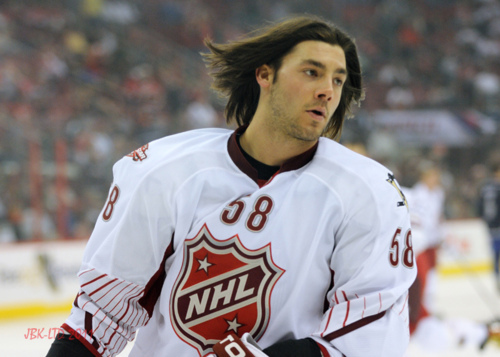 And unfortunately, most flow ends up looking more like this than the sleek, shiny locks of Letang. Their playoff beard never looks bad. Even though it definitely will. 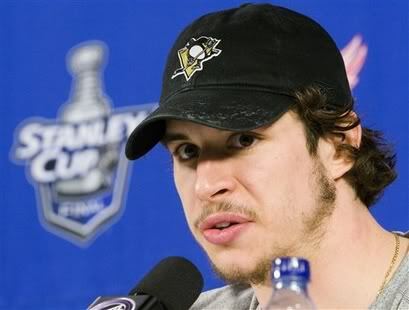 Like the flow, your hockey player will be quite proud of whatever is growing on his face. Whether it’s an atrocious Sidney Crosby attempt, or a full-on caveman beard like Zdeno Chara, it’s all the same to them. Bottom line is the beard is staying until playoffs are over. So why bother fighting it? Know the game! Even if you haven’t followed hockey long, your guy will probably be more than willing to explain everything. Once you can conquer icing and off-sides, you’re set. He’ll love your enthusiasm, and understanding the game better will make going to his much more enjoyable. It’s a win-win, really. So there you have it. Hockey is unlike any other sport and hockey players are unlike any other athlete, so suit up (extra props if you take that literally) and enjoy the unique lifestyle.